This is an alternative version of the previous comic from Monday 2012-11-26. We now revert to our once-weekly schedule and the next comic gets posted on Monday 2012-12-03. A first man on the left holds a pointer and moves it while he points with it to a vertically-mounted chart that contains irregularly-shaped objects. A second man on the right stands and watches. First man: We got your MRI. It's one of the cleanest MRIs I've ever seen. First man: Bone, tissue, fluids, all crystal clear. And those kidneys! In the next panel, a larger view shows only the chart and a portion of the pointer. The pointer is still moving, now pointing to a different location on the chart. Off-panel voice from the left: So pretty they ought to be in a textbook. 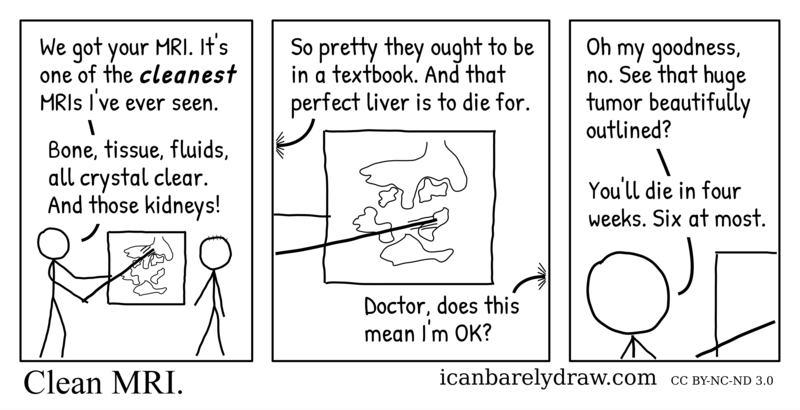 And that perfect liver is to die for. Off-panel voice from the right: Doctor, does this mean I'm OK? The third and final panel shows the first man's head and shoulders in a closer view, with small portions of the chart and the pointer visible near him. First man: Oh my goodness, no. See that huge tumor beautifully outlined? First man: You'll die in four weeks. Six at most.